Frankfurt is a metropolis, where the world obviously feels at home. Frankfurt is Germany's most international city: open-minded, tolerant and diverse. 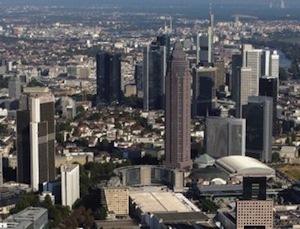 Frankfurt is the centre of one of the most productive and dynamic regions in Europe. As continental Europe's largest financial centre, home of the European Central Bank and to the headquarters of many companies, the international importance of Frankfurt continues to grow. Frankfurt is a dynamic European metropolis, a global village, a melting pot of cultures, languages and lifestyles. The imposing skyline is what newcomers remember most. But behind those glass facades the atmosphere is surprisingly relaxed. The Goethe-Unviersität Frankfurt am Main is one of the largest universities in Germany with 33.000 students. There are four locations of university institutions and the conference will take place in the campus westend, where most of social science and humanities are located. The campus westend was the headquarter of former IG-Farben Industries, than the second largest chemical enterprise in the world. After WWII the building was used as European headquarter of the American Army and with the end of the cold war the building comes to Frankfurt university. The house is situated in the Grüneburg Park, former in possession of the Rothschild-Family. We are very close to the city centre, the centre of European banks and money, and from the university you have an impressive view of the skyline: Corporate Images in modern and historical dimensions. The Villa Bonn, built in 1895-97, is one of the few fully preserved villas in Frankfurt, based in the Westend district, only minutes from the city centre and next door to the botanical gardens Palmengarten. It is used as the clubhouse of the society Frankfurter Gesellschaft für Handel, Industrie und Wissenschaft (Frankfurt society of business, industry and science), founded in 1919. Its founding members belonged to various professions and were of different religions but were united in their democratic and liberal beliefs. This free spirit was lost during the Nazi regime when the society was renamed Haus der Wirtschaft. 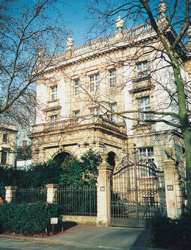 In 1947 the society was re-established and soon became an intellectual centre holding up liberal beliefs again. The list of famous personalities who have given talks there is long and includes Albert Einstein, Walter Rathenau, Thomas und Heinrich Mann, Ludwig Erhard, Carl Orff, Theodor Heuss, Willy Brandt, Henry Kissinger, Hermann Josef Abs, Wolf Singer, Angela Merkel. the leading German newspapers told its readers that Deutsche Bank was «the biggest bank in the world», the claim marked the climax but at the same time the end of an era. After the First World War the bank had to come to terms with a very different world. Before business was able to recover, Germany was hit by inflation. In terms of its political impact, the world economic and banking crisis was the most disastrous economic events of the century. Hitler's seizure of power in 1933 marked the beginning of the darkest chapter in the history of Deutsche Bank. By 1945, after twelve years of National-Socialist rule and six years of war, not only was the bank itself on the brink of the abyss; it had also allowed itself to become a tool of the Nazi state. In 1945, after 75 years in business, Deutsche Bank stood on the verge of ruin. The occupying forces allowed them to remain in operation on a very modest scale at regional level. Deutsche Bank was broken up into ten banks. Banking under the name ,Deutsche Bank' was henceforth forbidden. In 1952 an interim solution was reached with three regional banks. In 1957 the three merged to form Deutsche Bank once again. International issuing business became more important as Germany moved from being a debtor to being a creditor nation. A major milestone was the 1958 flotation of a foreign-currency with which Deutsche Bank reopened the German bond market to foreign companies. International business grew far more important in the 1970s. Deutsche Bank began to take shape as a global group. New branches abroad supported this development. The evolution of financial markets, technological progress and the acquisition of major banks in Italy, Spain, the UK, and the United States have all meant that Deutsche Bank has changed more in the last decades than in the preceding century. The 1990s were influenced by additional acquisitions and the establishment of subsidiaries abroad, in no small part against the background of political transformations in Eastern Europe and fundamental reforms in the bank's organizational structure. Today Deutsche Bank is a leading client-centric global universal bank. Its businesses encompass a wide range of products and services in investment, corporate and retail banking as well as in asset and wealth management. The Group operates in all regions of the world. 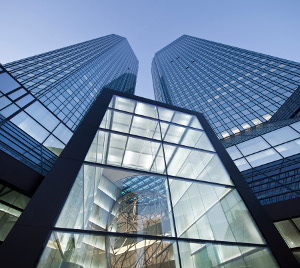 Deutsche Bank is the leader in its German home market and enjoys an outstanding position in Europe. The bank also has a strong competitive position in North America as well as in key emerging markets, particularly in Asia.